There are people who would never skydive or whitewater raft because of the inherent danger, yet they routinely court disaster with drowsy driving. More than a third of American drivers confess to drifting off in the driver’s seat, according to a report from the National Sleep Foundation. Drowsy driving results in roughly 100,000 crashes and more than 1,500 deaths a year, according to the National Highway Traffic Safety Administration. Drivers can’t have the mindset of powering through the fatigue–there’s simply no fighting human physiology, Knipling said. A nap is the best quick fix, but that roadside power nap shouldn’t be longer than 20 or 30 minutes and should be done in a safe place like a designated rest area or a well-lit parking lot. Exposure to bright light can also reinvigorate you, he said. A healthier lifestyle works wonders for alertness. A balanced diet and sufficient sleep are major contributors in reducing driver fatigue, said Knipling. 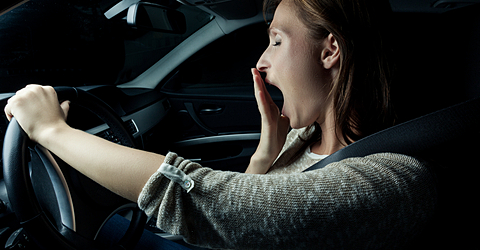 Live well, drive well: Proper diet, exercise and restful sleep make you a more alert driver. Don’t fight exhaustion: A 20- to 30-minute power nap in a safe place can recharge you for the next leg of your journey. Stretch your legs: Pull over and get some light cardio exercise in to get the blood pumping. Supplement the exercise with a caffeinated drink and you should feel alert shortly.